Construction This Scrap Book is post/chicago screw bound with buckram covers. 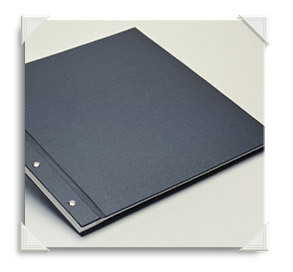 You can choose to use 20 polypropylene sleeves or 20 black paper or 20 mylar sleeves for the inside format. The versatility of the design means it can be expanded to accomodate extra sleeves.